Anna Belle Peyatt, 79, of Upperglade went home peacefully to be with the Lord on Friday, January 18, 2019, while at her home, surrounded by family. She was born September 02, 1939 in Gauley Mills to James Lilmer and Lillian Williams Hawkins and was a homemaker. 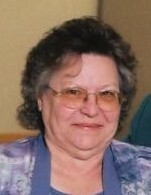 She was a member of Gladeview Community Church and enjoyed spending time with her family. Anna Belle is survived by her husband of 62 years, George A. Peyatt; children Carolyn Ann Lloyd of Craigsville, Tim (Bev) Peyatt of Upper Glade, Louise (Chris) Mullens of Cowen, Helen (James “Oz”) Gray of Drennen, Roberta (Jeff) Workman of Middlesex, NC, and Hance (Rodneyann) Peyatt of Rocky Mt., NC; daughters-in-law, Lynn Peyatt of Craigsville and Patricia Peyatt of Camden-on-Gauley; 33 grandchildren; 41 great-grandchildren; four great-great-grandchildren; and many other extended family and friends. In addition to her parents, Anna Belle was preceded in death by her sons, Tommy Peyatt, Marshall Peyatt, and William and wife Suzie Peyatt; son-in-law Roger, Lloyd; grandchildren, Robert, Amber, Rachael, Brenda, Patrick, and Jessica; great-granddaughter, Persephone; and nine brothers and sisters. Friends may join the family for visitation on Sunday, January 20, 2019 from 5:00 to 8:00 PM at Adams-Reed Funeral Home. Funeral Services to celebrate Anna Belle’s life will be held on Monday at 1pm at Adams-Reed Funeral Home with Rev. James “Oz” Gray, Rev. Craig Williams, and her son, Hance Peyatt officiating. Interment will follow in Alex Williams Cemetery. Adams-Reed Funeral Home is honored to be serving the Peyatt family.